From the bridge where Warschauer Strasse crosses the railway you can look back across sheet metal warehouses and flat industrial badlands to the TV Tower, the needle with the fat bobble that shoots into the air from Alexanderplatz. To the east and south there are excavations, rubble sites, graffiti, bicycle graveyards: After that, the square laid streets of austere five storey apartment blocks, many framed with the scaffolding of gentrification. It is the Ascension Day holiday, cloudy and cool. Ragged crowds pass through the knot of snack bars at the top of the steps leading down to the railway platform. A gang of youths in padded jackets block the way, drinking beer and singing along to a music player. At the U-Bahn station down the hill, a rapper with a ginger beard has attracted a small crowd of onlookers taking pictures with their phones; four or five men with pink ears and red hoodies are swigging from beer bottles as they perform a clunky dance in front of the rapper. 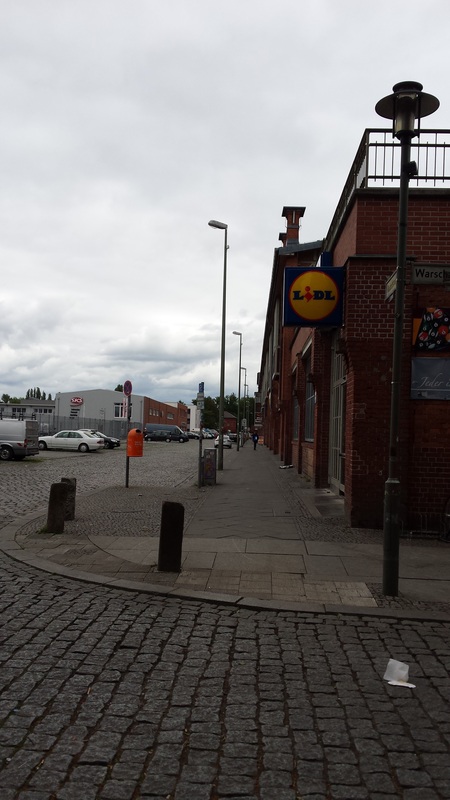 At the back steps of the U-Bahn lies this gaunt street, with the businesses closed for the holiday. Just past the LIDL supermarket is a Billiard Hall where they do breakfast from 6.30. It was open yesterday, very lively, with men drinking coffee and smoking on chairs outside.